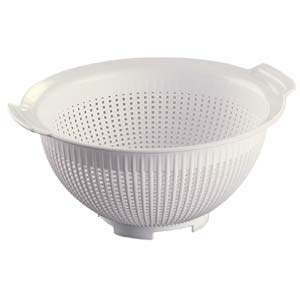 A white plastic colander which is 15 inches, 380mm wide x 172mm in height which will fit neatly into the 11L mixing bowls. It is made from hard white polypropylene plastic which is safe to go in the microwave, freezer and dishwasher for easy clean up after use. This colander is perfect for draining vegetables, it is incredibly versatile and perfect for use in busy commercial and domestic kitchens. Two lip style handles make it easy to carry and move, even when full, helping to make your food preparation quick and easy.